Once you have invested in solar power then the next step is to manage the use of your self-produced power to get the most benefit from your system. One way to maximise the benefit of solar is to install a power diversion controller such as the Solar Immersion unit. This unit works by monitoring your power production and diverting any power you are producing that is not being immediately used in your home to your electric hot water cylinder, underfloor heating or other power circuit. This means that rather than exporting your power back to the power company for minimal credit, you keep it in your home, almost like turning your hot water cylinder into an energy bank. 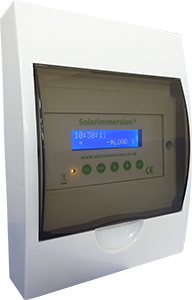 With the SolarImmersion Self Consumption Controller all of your solar energy can be used in the home. No more exporting your power to the power company for a miserly 7c kWh. All of your excess power that is not being used at the time of production can be directed to your hot water cylinder, under floor heating, spa pool heating, swimming pool heating or battery storage to ensure that you get the most out of your FREE solar power. Unlike solar thermal systems there is no energy wastage – feed the house, feed the hot water and any excess goes to the grid. Due to low or even zero feed in tariffs you get a significant ROI by using and storing your energy during the day for later use without the grid. SolarKing supply and install the SunGrow Smart Home energy management solution, giving you the power to manage your power usage within your home. Facing with the challenges of record-low feed-in tariffs and utilities enforcing zero exports, consumers suffer not only from an ever-increasing electricity prices, they also make very little from selling off excess green power or absolutely nothing at all to meet the zero export restriction. 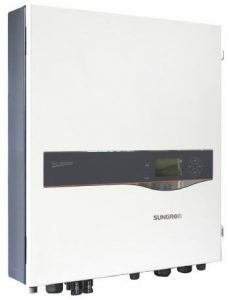 Why Do You Need the SunGrow PV ESS (Photovoltaic Energy Storage System)? Electricity used in peak times can place a strain on the grid network, that is why some utilities charge premium during peak period. The average power consumption of a typical household for instance, 28% of its usage during peak period would contribute to 53% of the total electricity bill. In the above scenario, families are much better off financially by installing a PV power generation system giving you the ability to manage and control your power consumption during peak periods. Sungrow SH5K PV ESS is an ideal choice to facilitate the self-consumption of PV power by storing excess power into the battery. Depending on your power consumption and solar panel system size the SunGrow system can be configured for zero energy export or to power batteries with excess solar power. In addition to the daily, monthly, annual and total data of power generated, the SH5K PV ESS is capable of recording power imported from the grid during peak tariff period. This allows the customers to sensibly select an appropriate size for the battery based on its own consumption history. Maximize the return of investment by matching battery usage to peak tariff period. > On Weekdays (from Monday to Friday) or at weekends (Saturday and Sunday) with two time periods for each option. User can charge the battery during off-peak tariff time or set the forced charge time according to the analysis of load power recording. If the energy demand of the household during 7:00 am-9:00 am is 2 kWh, set the forced charge time to be 1:00 am-7:00 am with the target SOC of 40% (battery capacity 6 kWh). The SH5K PV ESS will charge the battery until its SOC reaches 40% before 7:00 am, so as to ensure the energy demand in 7:00 am-9:00 am. > SunGrow Smart Energy Management– A PDF specification sheet.